Though the levy is called cess, it shall be in the nature of tax (service tax) and collected as such. Swachh Bharat Cess (SBC) would be levied on the same taxable value as service tax. SBC would be levied, charged, collected and paid to Government independent of service tax. The provisions of Chapter V of the Finance Act,1994 and the rules made there under are applicable to SBC also. Abatement would apply for Swachh bharat cess also in the same manner as it applies for Taxable Services. (Notification No. 23/2015-ST Dated 06th November, 2015.). For example, in the case of GTA, [Service Tax + SBC]% would be (14% Service Tax + 0.5% SBC) X 30% = 4.35% (4.20%+0.15%). Notification No.24/2015-ST dated 12th November, 2015 - to provide that reverse charge under notification No. 30/2012-ST Dated 20th June, 2012 shall be applicable for the purpose of levy of Swachh Bharat Cess mutatis mutandis. 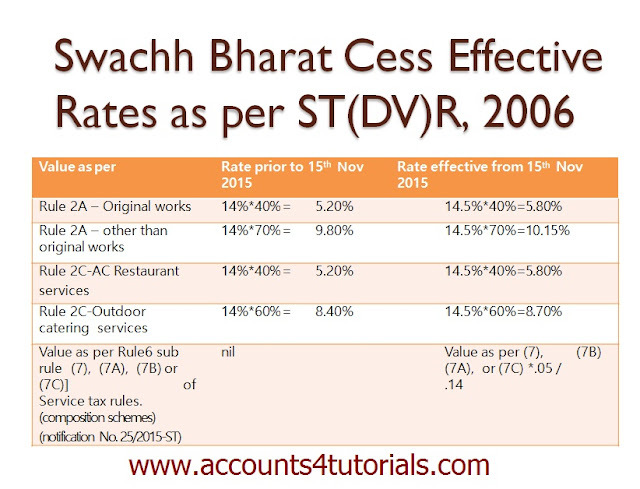 Therefore, Credit of Swachh Bharat cess Cannot be Availed. Swachh Bharat Cess Cannot be paid by utilizing Credit of Any other Duty or Tax. To be Paid In CASH only. The Central Government may, after due appropriation made by Parliament by law in this behalf, utilize such sums of money of the Swachh Bharat Cess for the purposes of financing and promoting Swachh Bharat initiatives or for any other purpose relating thereto. 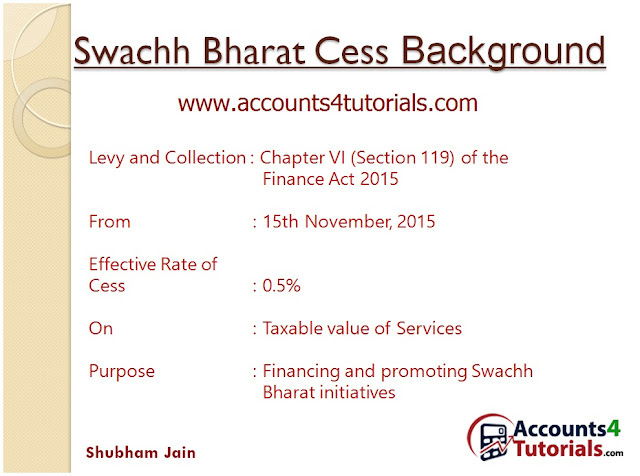 “CHAPTER VI ‘SWACHH BHARAT CESS 119. This Chapter shall come into force on such date as the Central Government may, by notification in th e Official Gazette, appoint. There shall be levied and collected in accordance with the provisions of this Chapter, a cess to be called the Swachh Bharat Cess, as service tax on all or any of the taxable services at the rate of two per cent on the value of such services for the purposes of financing and promoting Swachh Bharat initiatives or for any other purpose relating thereto. The Swachh Bharat Cess leviable under sub-section (2) shall be in addition to any cess or service tax leviable on such taxable services under Chapter V of the Finance Act, 1994, or under any other law for the time being in force. The proceeds of the Swachh Bharat Cess levied under sub-section (2) shall first be credited to the Consolidated Fund of India and the Central Government may, after due appropriation made by Parliament by law in this behalf, utilize such sums of money of the Swachh Bharat Cess for such purposes specified in sub-section (2), as it may consider necessary.